Nelson Search and Rescue evacuated an injured skier Saturday from Five Mile Basin behind the Whitewater Ski Hill. Jan. 4, 2016 8:00 a.m.
Nelson Search and Rescue evacuated an injured skier on Saturday from the Five Mile Basin. Spokesman Chris Armstrong said a “well-equipped ski” group was enjoying the area and good conditions when a member fell, resulting in a knee injury. Due to the location and difficulty of getting the injured person out of the valley before dark, search and rescue was called. Searchers accessed the area by helicopter, but the area was unsuitable for a landing, so the team performed a hover entry and transported the injured person to ambulance personnel at the Nelson airport. This group was from out of country and tried to evacuate the subject on their own, fearing a rescue bill. But before things got out of hand, a local told them that in Canada there is no charge for such rescues. “Nelson Search and Rescue and the BC Search and Rescue Association would like the public to know that we do not charge for rescue in Canada,” Armstrong said. 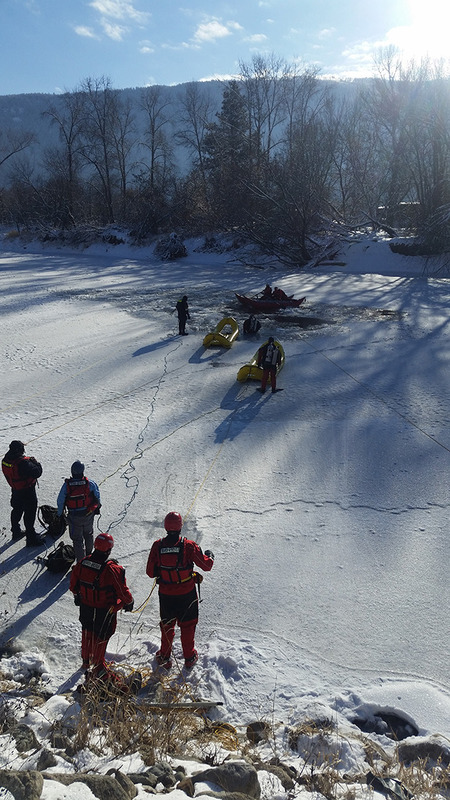 Nelson Search and Rescue was also involved in the recovery of a man who died after falling through ice on the Kettle River just east of Grand Forks on Dec. 30 (pictured at left). A Nelson searcher was flown to the scene and a swiftwater team followed. Before special resources arrived, the man was lost in the river. Armstrong said it’s not known how long he was in the water before his calls for help were heard. The search was called off after dark. The following morning, further search and rescue resources arrived from Nelson, Oliver, Osoyoos, and Penticton as well as an RCMP dive team. Around 10:30 a.m., the man was found in the river by ice rescue teams. The police dive team recovered the body, which has been turned over to the BC Coroners Service. Armstrong said ice needs to be at least four inches thick to walk on safely and river ice can be very unpredictable due to moving water and melt/freeze cycles. “It is never safe to walk on or near ramped river ice without raining,” he said.